Our staff thoroughly researches and browses through collections of rustic bedding from top brands. We're looking for 4 things: quality, style, variety, and that earthy, warm feel of rustic bedding. It's what our customers expect and what they will find on Lodge Craft.com! Each rustic bedding manufacturer uses the highest quality materials. Each set has an array of other pieces in addition to those pictured below. 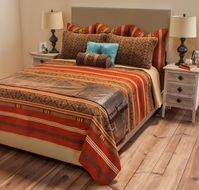 The rustic bedding images below are a sampling of our manufacturers styles. We know it can be overwhelming to shop online, so we've tried to make things easier for you. Please click the thumbnail below for the complete bedding product line of the manufacturer, broken down for your ease and convenience. 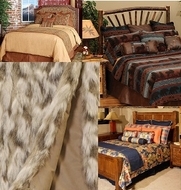 Please select a bedding manufacturer image to see more products & information.